Iwi leaders want control and priority rights to New Zealand’s freshwater in perpetuity. The National Government is preparing to give it to them. Not outright – that would create too much of a political backlash. But by stealth – catchment by catchment, council by council. National launched a consultation document earlier this year, but with so little publicity that most New Zealanders would have been unaware that submissions had been called on their radical proposals. 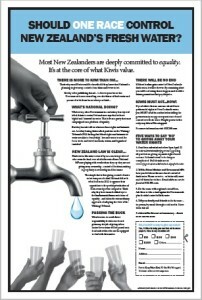 That’s why we produced a newspaper advertisement – to explain what was going on and to urge concerned New Zealanders to send in submissions. We launched an urgent fundraiser to enable us to publish the ad in major newspapers throughout the country. Thanks largely to the support of readers of our newsletter, the full page ad ran in major newspapers over a two week period and resulted in a flood of submissions and messages to MPs. Details of the submissions have not as yet been published, but we intend to analyse the results as soon as they are available. As a result of our campaign, the Prime Minister confirmed to the media that the Government is unlikely to move further on their fresh water reforms before the 2017 election. This is the very best outcome we could have hoped for – especially if the Maori Party no longer holds the balance of power after 2017. The Ministry for the Environment has also confirmed that if the Government decides to continue down this path at some stage in the future, there would be another round of consultation before any specific fresh water reform proposals are put into a bill – so that means there would be another opportunity, at that time, to raise awareness of the issues. Without the NZCPR’s intervention, the whole matter of iwi control would have slipped through unnoticed. But we intend keeping a close eye on future developments, especially now that the Waitangi Tribunal has announced it is undertaking Stage Two of its fresh water inquiry – with the Maori Council stating that it will be pushing for a price on the use of water, with money paid to Maori groups, who should have “first right to all commercial development opportunities” in their area. Accordingly, we are continuing to build a fighting fund for more public information advertising, as this issue is clearly not going to go away anytime soon! To support our fighting fund, please click HERE. Freshwater is a resource that is owned by no-one but is used by all. Currently, it is managed by councillors elected to Regional Councils and Unitary Authorities. That’s the way it should stay. The main way to keep informed about our campaign is to ensure you are registered for the free weekly newsletter of the New Zealand Centre for Political Research HERE. We will update readers about the campaign on a regular basis. You can see the ads we published in the awareness campaign we ran last November by clicking HERE. We knew that unless we informed the public as soon as we found out what was going on, they would never believe the Government could be planning to pass control of water to iwi authorities, and so when public submissions were called, opposition would be weak. Our two campaigns ensured that did not occur. If you oppose the race-based control of fresh water, why not tell MPs and councillors and what you think. People power is the only way to defeat iwi calls for fresh water control. *The email addresses of all Members of Parliament can be found HERE. *The email addresses of all local authority Councillors can be found HERE. You can see first had what iwi are pushing for by visiting the Iwi Chairs Forum website and reading their reports on the ownership and control of freshwater HERE. We are running an on-line petition on the ownership of water – you can view it HERE.